If you made a change to your website in your dashboard (such as updated a widget, added css code, or changed settings), and the changes aren't showing up on your website, chances are you need to clear/empty your cache. The purpose of caching is to speed up your website and improve user experience. It does this by saving or "caching" a website's files and storing them nearby, which makes a site load faster next time you visit. However, sometimes this can cause you not to see changes you make to your website, which can be frustrating. In that case, you'll need to clear your cache to see the changes. There are three main types of caching that we'll cover: browser caching, Wordpress caching plugins, and server caching. Instead of pulling every file that a website has all the way from a host server each time you reload the page, your browser will save some files locally on your computer (stylesheets, images, etc). The next time you visit the website, it'll load faster. This is called browser caching. The downside to browser caching is often your browser doesn't recognize when a change to a file has been made. Instead of fetching the updated file, it'll reload the previous cached version of the file. If you made a change to your site and it's not appearing when you reload your site, your first step will be to clear your browser cache. Note: you will also need to clear your mobile browser cache to see the changes on your mobile device. 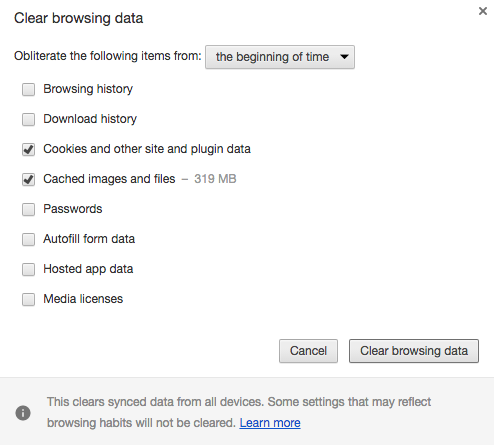 Below we'll show you how to clear your browser cache in Google Chrome. If you are using a different browser, use this handy tool to find out how to clear the cache in any browser. 1. In the top right corner of your Google Chrome browser, click on the Settings button (three vertical dots). 2. 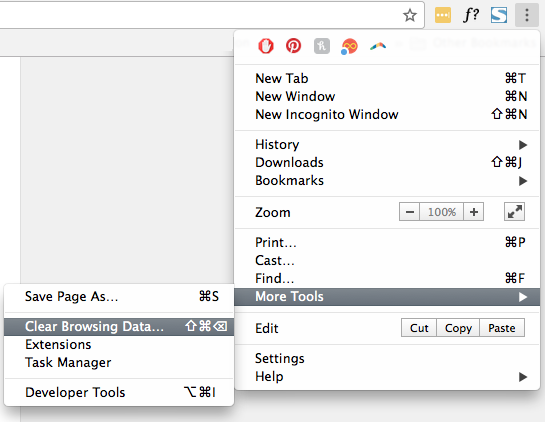 Go to More Tools > Clear Browsing Data. 3. This will bring you to a page where you can select what content you want to remove. Be sure that "cached images and files" and "cookies and other site data" are both checked. Then click the Clear Browsing Data button. 4. You've successfully cleared your browser cache! Reload your website and see if the changes are appearing. If not, move onto the next section of this article. Caching plugins speed your site by reducing the load time of files on your website. The two most popular caching plugins are W3 Total Cache and WP Super Cache. To clear the cache in W3 Total Cache, go to Performance > Dashboard in your Wordpress dashboard. Click the "Empty All Caches" button. To clear the cache in WP Super Cache, go to Settings > WP Super Cache in your Wordpress dashboard. Click the "Delete Cache" button. If you are using a different caching plugin, refer to the plugin documentation to learn how to empty the cache. Some hosts automatically install a caching feature on your site. This will vary from host to host, but you may see "Caching" tab in the top admin bar of your site. You can clear the host cache there. Additionally, some hosts utilize server-side caching, though it's not as common. If you have cleared ALL of your caches – browser and plugins – and your changes still aren't appearing, contact your host and ask if server caching can be disabled on your site. If you installed Wordpress software through Bluehost, a hidden caching plugin may have been installed on your site. Go to Plugins > All Plugins > Must-Use. Click "Purge Cache" under Endurance Page Cache. Bluehost users may also have a "Caching" button at the very top of the dashboard in the admin bar. You can hover over it and click "Purge Cache" there as well. Finally, some Bluehost sites have a server-side cache called Varnish that can be turned off. See this article.